Growing up, I was very lucky to have a Vietnamese mother who loved food. Not only loved food, but loved to cook. We’d have huge family gatherings where people would come over and gorge on my mother’s huge spreads of steaming, fresh, Vietnamese food but I never really thought about how not every family was fortunate to enjoy home cooked meals every day, let alone epic Vietnamese ones bursting with flavour. I remember waking up for school groggy and unmotivated to get out of bed until I caught the scent of sweet, fresh steamed buns wafting upstairs from the kitchen. 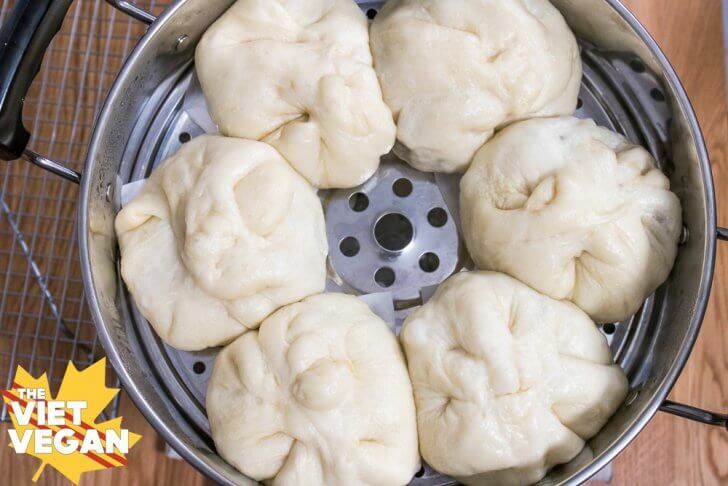 I have no idea how she did it, but every now and then my mom would wake up at 6 to cook these complicated dishes like banh cuon chay or these banh bao chay so I could enjoy them for breakfast. Even when I was younger, I remember my mom tasking me to cutting pieces of paper into squares to sit underneath the buns in the steamer pot so it didn’t get stick to the metal. Back then I distinctly remember cutting up my blue, Hilroy lined sheets of paper, relishing in my ability to cut them evenly without needing to fold or measure them. When we ate them I always had to choose a bun that didn’t have one of the binder holes in its paper, despite the fact that it didn’t even make a difference. The pork-filled buns my mom used to make were sweet and savoury with a wedge of hardboiled egg and fresh peas that often fell as I was more or less burning my mouth on piping hot bun. The sweet outer dough was tender and fluffy as a cloud. So many foods I thought I wouldn’t be able to enjoy again, I’m so happy to veganize and now enjoy. I hope one day my kids will be able to grow up knowing these Vietnamese delights, either made by me or my family, but hopefully anyone else out there who grew up with these can make them vegan to enjoy a part of their childhood again. The video I made for the recipe was in collaboration with Rose from Cheap Lazy Vegan! For the video I had intended to double the recipe for the dough that I had been working with, but I doubled the flour and not the rest of the ingredients, which is why it was a hot mess for the video. But don’t worry, I retested the recipe and modified it to be what it is in this post haha. I hope you enjoy the shenanigans nonetheless. We also filmed my pho recipe (with some modifications) together if you want to check that out too! 1/4 cup soy sauce (I used Golden Mountain Soy Seasoning), you'll be adding this tbsp by tbsp. In a separate bowl, combine water, yeast, and sugar and stir to combine and allow the yeast to bloom. In a large mixing bowl, combine cornstarch, salt, baking powder, and 4 cups of flour. Once the yeast has bloomed, combine the yeast mixture and half the oil to the dry mixture and stir to combine. It'll be a very sticky dough, but it should come together and be slightly tacky. Turn onto a clean and then lightly floured surface and knead until moderately smooth and elastic, about 10 minutes. Place the dough back into the mixing bowl (it should be relatively clean if you pull any extra dough off of it as you were mixing it). Coat the dough in the remaining amount of oil and mix in as well as you can. It will be quite tacky but that's okay. You should be able to incorporate most of the oil but turn the dough in the bowl to coat in oil just before letting it rest. The dough should absorb the rest as it rises. Cover with a damp towel and let rise in a warm place (like microwave or oven) for at least 1 hour. It should rise a little but don't be too worried if it doesn't rise too much. 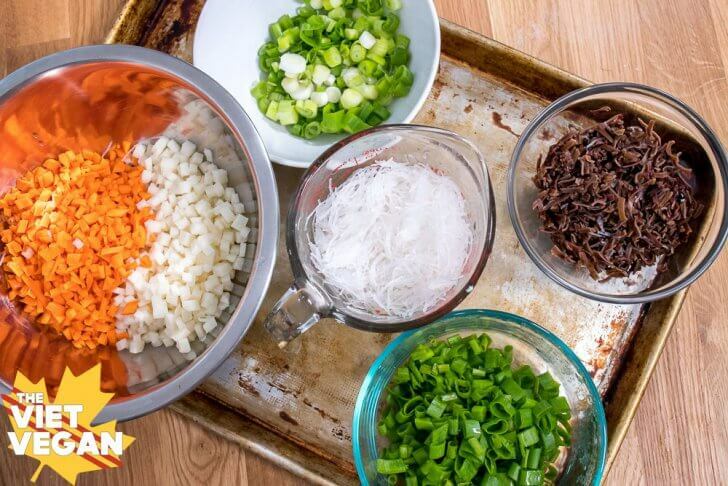 In a large wok/pot/or pan with high sides, cook the whites of the green onion with 2 tbsp of oil for a minute or two over medium high heat. Add the finely diced jicama and carrot and cook until carrot is tender. 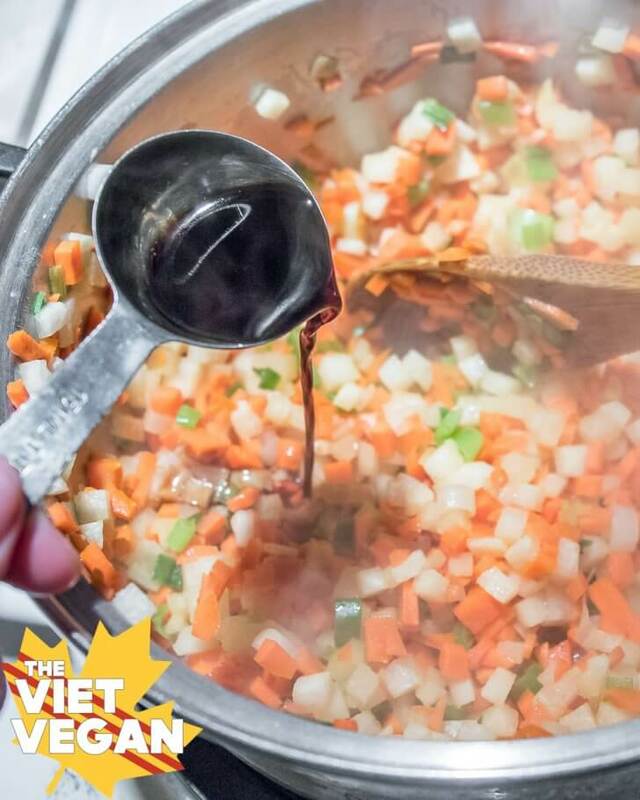 You may need to add 1 tbsp of the measured soy sauce and about 1/3 cup of water to cook and deglaze the bottom of the pot. 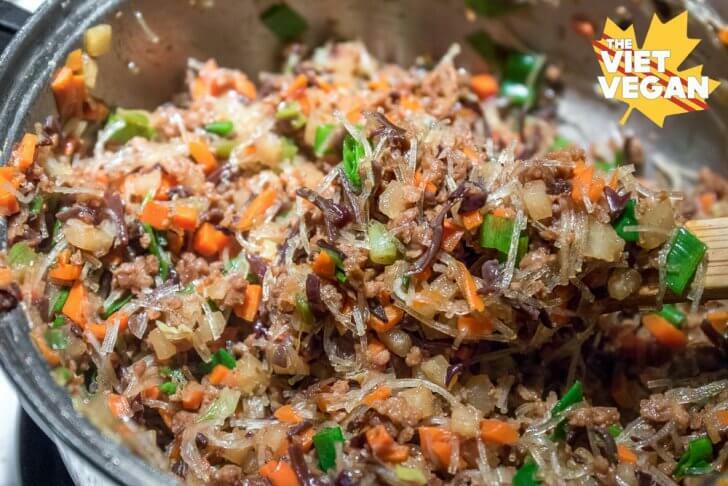 Once carrot is tender, add the chopped black fungus and stir to heat through, about 3 minutes. Add the vegan ground round and stir into the mixture. Add 2 tbsp of the soy sauce and stir to combine and heat through (about 3 minutes again). Add the chopped, hydrated mung bean noodles, the last of the soy sauce, the greens of the green onion and stir to mix through. As the noodles cook, they'll absorb moisture from the rest of the mixture and sort of bind it together to make it easier to stuff the bao. Add white pepper to taste (you may need to add more soy sauce or salt if desired, but I liked it at 1/4 cup. Let it cool until it's just warm before you fill the bao. After about an hour or so of the dough resting, turn it over to a floured surface and divide between 10-12 pieces (If you're really intense about exact measurements, it's about 100g per piece of dough). Cover the cut pieces with a damp towel while you're stuffing them so they don't dry out. Generously dunk the cut piece of dough into some flour then roll out to about 1/4 inch thickness (5-6 inches in diameter). Add about 3-4 tbsp of the filling into the middle of the dough then pinch the outside edges together and twist to seal the bun. Fill a steamer pot with about 5 cups of water + 1 tbsp of vinegar. The vinegar will help brighten the buns as they steam, resulting in a lighter bun in the end). 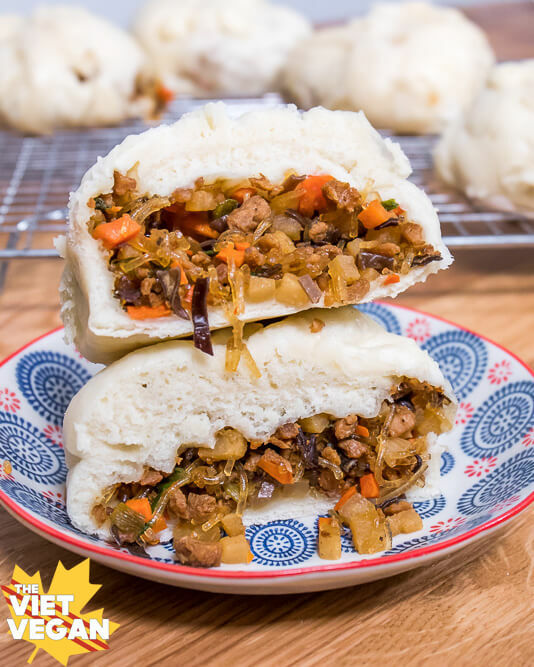 Place the pinched bun on a perforated layer of a steamer pot on top of a parchment paper square. Repeat and fill the buns with the remaining filling. I tend to go quite heavy handed with the filling, and I ended up using all of the filling for these buns. If you find you have any extra leftover, put it on rice, in fresh spring rolls, or on lettuce cups for lunch. Try not to put the buns too close together like I did in the photos, if they're touching, they'll tear once you pull them apart after cooking. If you find you need them to touch, place some parchment paper in between so they don't stick. Steam on medium heat for 20 minutes, then take off the lid and let them steam for another 5 minutes. Remove from heat and let the buns cool on a wire rack. For any leftovers, wrap them as soon as their cool in some plastic wrap (if you put them in a container they'll dry out). To reheat, either re-steam or microwave for 2 minutes. Thank you so much Lisa! I made these today and they are soooo good! Made mine with spelt flour. Dear Lisa, oh my gosh I failed so hard on these. usually I am great with yeast and dough, but this time... I don't know, I really don't. First time making steamed buns myself. The dough got so super soft and expanded real fast. Once I tried to shape and fill the buns, it got even softer and by the time they steamed they weren't bun-shaped anymore, they were flat discs. I don't know what went wrong, but ugh... I wanted to master these so badly! Well, you got me! Def not the last time trying to make these! Oh no!! It sounds like there wasn't enough flour :( Sometimes the humidity of where you are really affects it, so if you're experienced with dough, just add a bit more flour until it feels right! This looks interesting. 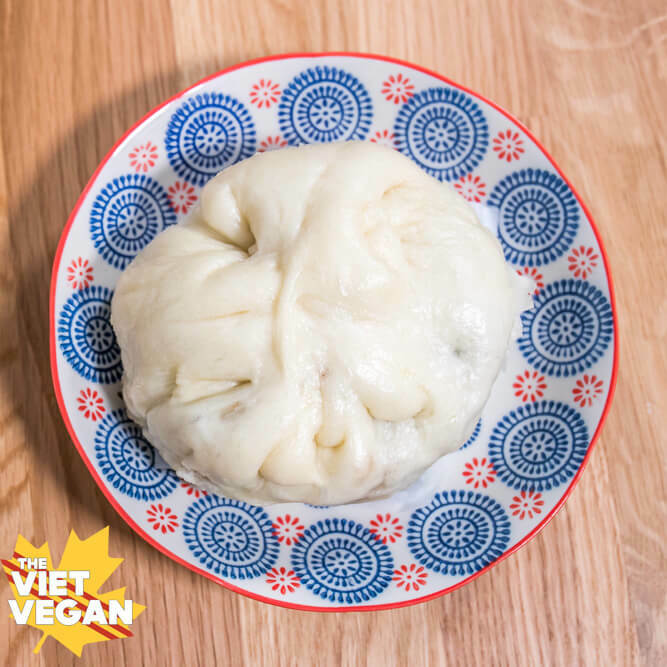 These vegan steamed buns are so inviting. Will definitely try this soon once I am able to grab the ingredients needed. Thank you for sharing the recipe. I made these before and they were just wonderful! I want to make them again badly but I’ve developed an intolerance to gluten.... what do you think about trying to make the dough with gluten free flour? not too sure if it would rise enough! Rosalie, I made these using Bob red mills gluten free pizza dough mix with a little extra sugar. I think you need to lower the amount of liquid the pizza dough calls for. Hope this helps! I'd love to try these (they look amazing!) but I'm not sure how much a "bunch/portion" of the noodles is. Could you provide a more specific measurement, for those of us who are not familiar with mung bean vermicelli?I'm also not sure how much TVP to use...do you have a suggested measurement on that? Hi Caitlin,Most mung bean vermicelli is separated in each package into these portions, but it's about 1 cup once soaked per bunch? I show you guys in the videos I believe what it looks like. Have you tried making these with no oil? can I use coconut milk instead soymilk? Coconut milk will probably be a little thick, you may need to adjust the amount of coconut milk but either way you just need some sort of liquid.